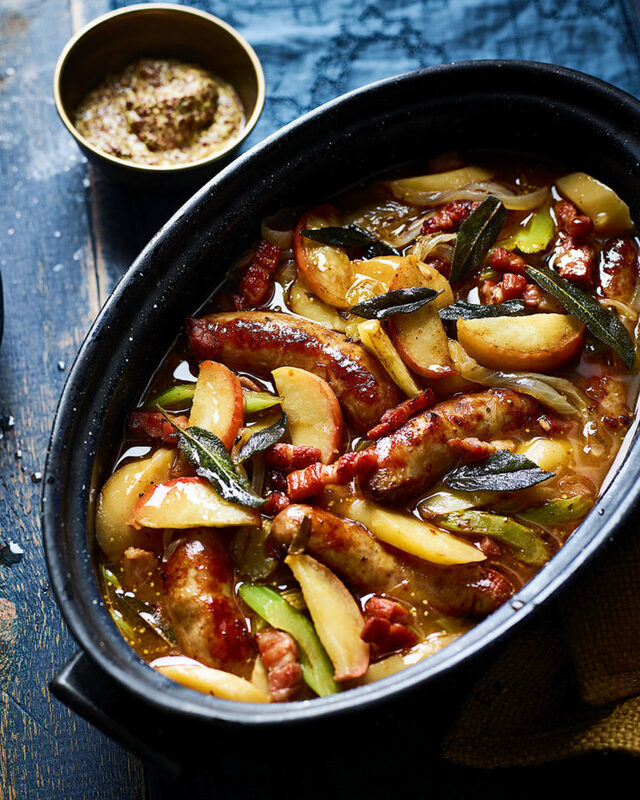 Pork, cider, apples and sage is a classic flavour combination that always delivers. Enjoy them in this incredible casserole bursting with sweet and salty notes. It’s a real winner. Heat the oven to 180°C/160°C fan/gas 4. Heat the oil in a large flameproof casserole (with a lid). Add the sausages and brown them all over, then transfer to a plate. Add the bacon lardons to the casserole and fry for 5 minutes until the fat is crisp and brown. Transfer to the plate with the sausages. Drain off all but 1 tbsp of the oil from the casserole, add half the butter and, when melted, add the onions and garlic. Cover and cook for 10 minutes, stirring now and then, until soft and lightly browned. Take off the lid, stir in the parsnips and celery and cook for 2 minutes more. Stir in the tomato purée and flour, then gradually stir in the cider and stock and bring to the boil. Return the sausages and bacon to the casserole, then stir in the sage and mustard. Cover, put in the oven and cook for 40 minutes. When the casserole is ready, melt the remaining butter in a non-stick frying pan. Quarter, core and slice the apples into wedges. Add them to the pan and fry gently for 2-3 minutes until golden all over and just tender. Season with a little salt and pepper. Remove the casserole from the oven, stir in the apples and season to taste (add a squeeze of lemon if you think it needs it). Sprinkle with the fried sage leaves, if using. Serve with baked potatoes or mash and greens. Cool, then chill for up to 3 days in an airtight container or food bag. Freeze in 4 foil containers (or one large one) and cook from frozen in a medium oven for at least 1 hour until piping hot. Cook the apples to serve. A dry English cider works here, as does a ripe, peppery red côtes du rhône.